$30 - a $5 Savings! Save $5 with the purchase of the Seven(7) tile Classic Fantasy Series Bundle! Two(2) 10" x 16" full colour tile set. With the horde of Orcs hot on their heels, the adventurer's saw the cliffs of Kjells Canyon up ahead. If they could make it across the bridge, they could cut the ropes suspending it over the canyon and escape their enemies. Halfway across the bridge, the adventurers knew that they had escaped. The nearest Orc would not reach them before they had gained the far side of the canyon. They could cut the ropes holding up the bridge and be free of their pursuers. Suddenly, before their eyes, twin fireballs burst on the ropes, burning through them and collapsing the bridge, with them on it! 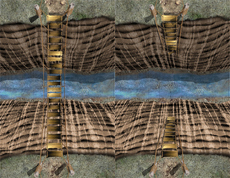 Do the adventurers fall into the river that snakes its way through the canyon? Can they hold on to the pieces of the bridge and climb back to the top? Which side do they end up on? Three(3) 10" x 16" full colour tiles. With a freshening wind filling her sails, the merchant ship Dame Wilhelma cast off from her berth at Falstaff Harbour. Captain Markus and his crew were headed to Port Fustansel, a six-day voyage. Following a fortnight of searching by fellow merchant ships and Imperial fleet vessels, she was officially declared lost at sea. Speculation ran rife among the local sailors and captains at the cause of her disappearance. Except for the occasional mild squall, the weather was excellent during the period of her trip. The Imperial fleet constantly patrolling the trade routes made piracy very unlikely, if not impossible. The Dame Wilhelma's captain and crew were esteemed as a seasoned and skilled crew. Illuminated by flickering torchlight, this undersea harbour has been used for generations by pirates, slavers, smugglers, partisans, mercenaries, and the occasional villain who wants to take over the world. A large portcullis that is opened and closed by a powerful hand cranked winch secures the entrance. Previous owners have encouraged sharks to dwell in the underground harbour by feeding them table scraps and the occasional unlucky hostage whose ransom fell through! Deep in the heart of the Dwarven mountain of Khaldzudun is a place known as the Fire Core. It is here that Dwarven craft smiths produce the finest armour, weapons, and jewellery in all the land. The furnace is built around a primal fire that spouts straight from the Earth's core. A natural spring, rich in unusual minerals, provides ice-cold water to temper the heated steel of the Dwarven craft smith's creations. Two magical anvils, Hammersong and Knellstone, dating over a hundred generations, imbue all the Dwarven creations with enhanced strength and power. Guarding the approach to this sacred artifact is a pair of statues of the great Dwarven craft smiths Dursan and Oriel.